Brad and his son Austin brought the hammer down on this healthy hog. 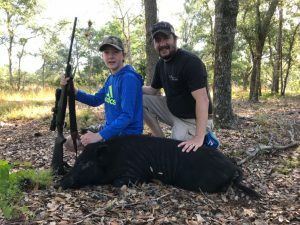 Hog hunting is fun for everyone and a great way to introduce kids to the outdoors. Action packed year round hunting makes hog hunting the perfect adventure regardless of skill level. Congrats again to Brad and Austin, thank you for the opportunity to guide you on your hog hunt.